Even in Japan, where daily life is guided by law, discipline, and traditions, cybercrime rears its ugly head. Imagine a young man, 17 years of age. Imagine him being arrested for several cases of ransomware distribution, attempted hacking, and credit-card fraud. His toolbox of choice: one of the many Japanese message boards that cater to such shady activities, platforms that enable like-minded individuals to not only dabble in cybercrime, but also use it to make a living. This isn't just fantasy. It's a reality in the Japanese underground, where private and cloistered online communities protect cybercriminals by way of forced anonymity and stringent gatekeeping. This report offers a detailed look into the growing Japanese underground, its marketplaces, and its economy. It discusses the cybercriminal underground bred by Japan’s strict legislation and overall approach to tackling crime, and how the country’s hard-coded culture of contrasts has made this specific cybercriminal underground one of the most unique that we’ve ever had the opportunity to explore. 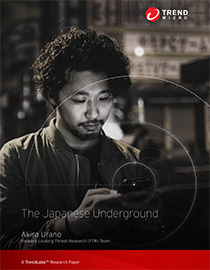 The report tackles everything we’ve discovered about the Japanese underground, from its criminal activities and its illicit services to the traits and idiosyncrasies that distinguish it from those we’ve covered before. It also covers how forced online anonymity—a trend that Japan started with its public message boards—is also helping this particular underground economy flourish. The pricing of certain cybercriminal underground staples, such as cloned and/or compromised credit cards, Paypal™ bank accounts and fake passports. The latter in particular is sold cheaply compared to other sites in the deep web – US$700 for a US passport from Japanese cybercriminals, compared to US$5900 from other sources. View more details in the full report, The Japanese Underground.